400 Artists/18 Projects/25 Locations/2000 Attended Last Year! 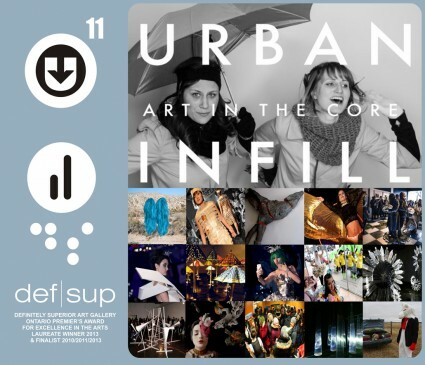 smells like Spring… Urban Infill is waking…Celebrating it’s 11th Anniversary year! Experience Thunder Bay transformed by multi-sensory art and unparalleled live performances in this Nuit Blanche-like event. Revitalizing our downtown by capitalizing on assets of art and culture, and linking/reinforcing connections through accessible empty spaces and existing arts, commercial business/social spaces. With vision and innovative arts and business, we can fill up the empty spaces in our downtown, and help to connect and create that unique niche of an urban arts and entertainment district. ~Re-discover your north core Waterfront District through contemporary art! Featuring works by 400 regional, national and international multi-disciplinary artists at 25 downtown locations, including DefSup, commercial spaces, art galleries, artist studios, and empty spaces transformed into new art/performance venues. One of the largest presentations of visual and media arts, unique to Thunder Bay. See “Wearable Art” in window spaces, 9 live bands & DJ’s, Couch Money Karaoke, window art installations, World Dance (Belly Dance, Bhangra & Classical Chinese), performance art, fringe theatre, drag performances, glow & fire spinning street performances, film screenings (incl. 360 degree immersion), interactive window media art installation, Oculus Rift Virtual Reality experience, catered refreshments by Prime Gelato, Sweet Escape Cake Cafe & Bakery, Sushi Bowl and so much more! ~Over 6,000 sq.ft. of new exhibition space! Featuring works by: LU Visual Art Students, DefSup Members, Die Active/Neechee Studio (new generation art collectives), Confederation College student works: Film Dept (Conflix Films selection) & Interactive Media Development (Oculus Rift Virtual Reality installation/try the VR goggles! ), Bay Street Film Festival (360 degree-immersive film experience!). Commercial Galleries/Spaces: Ahnisnabae Art Gallery, Chenier Fine Arts, Local Colour Art Gallery, Gallery 33/Painted Turtle, Lucy Nova, Espresso Joya, The Walleye, New Day Records, St. Paul Roastery, Prime Gelato, Artist Studios: Lucy Nova & Tomlinson Block (upstairs): Robin Ranger (art+jazz), David Winters, Sam Shahsahabi, DZ Photography (free Social Media Portraits!). The first Tours of the evening, leave the gallery shortly thereafter. You can join or leave a tour anytime during the Opening. Performative Tour Guides: Lizzy Lee, Katie Ball, Sara Mackie, Angela June & Melissa Marie. Wearable Art Window Performances at: Hill City Comics, Ahnisnabae Art Gallery, Perfect Fit Lingerie, Mars.Clothing, The Loop, former Yorgos [234 Red River Rd], White Macgillivray Lester LLP [Law Firm Bldg./1 Cumberland St. S.] and The Green Room (Paramount Theatre/Maple Tops Bldg, 24 Court St. S). • Roaming glow spinning street performances by Dee Marie & The Kidd. • Couch Money Karaoke (audience participation-at New Day Records & St. Paul Roastery-ringleader/artist: Shayne Ehman). • Betty Carpick (window curtain w/ toasted bread & thread -at The Walleye-St. Paul St). – MDM Developers / Former Eaton’s Bldg. (corner of Red River Rd. & Court St.]. -Photographers: Flashback Photo, Kirvan Photography, Keegan Richard, Patrick Chondon, The Walleye. – Media Sponsors: The Chronicle Journal, The Walleye – Thunder Bay’s Arts & Culture Magazine, LU Radio – CILU 102.7 FM, TBshows.com.